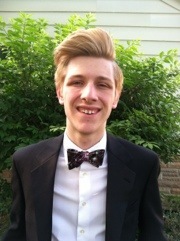 My son went to his Senior Prom last night, and it seems like he started Kindergarten just last week! I bought him a tuxedo on sale because it was cheaper than a rental. Hopefully he’ll have more opportunities to wear it than this one night but girls buy dresses that only get worn once all the time so I can’t complain. 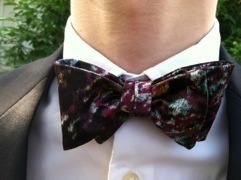 He wanted a colorful bow tie but not a pre-tied, the kind that you tie yourself. Unfortunately he couldn’t find one that he liked. But hey Mom can make one, right? Right! 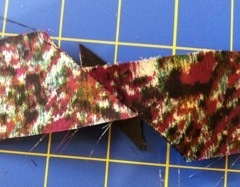 I found a tutorial, video and bow tie pattern by none other than Martha on her website here! So off we went to the local fabric emporium in search of just the right fabric. He brought a friend to help with the fabric selection. I don’t know how helpful she was but it seemed like every few minutes I was untangling her from a bolt of fabric that he had wrapped draped around her. I found myself wondering if he was actually still in Kindergarten! 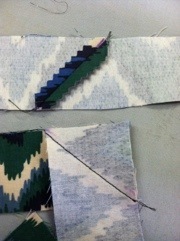 We finally settled on 2 fabrics and suddenly I was making 2 ties. At that point I would have made 10 ties just to get away from the 2 goofy Seniors who were now both wearing pink hats and bolts of fabric. Then that adorable sweet son suggested we all go out to lunch…. I started to agree touched that he wanted to spend time with me — and then realized that I was only being invited so I could pick up the tab – hmmm I said no to lunch! Parenting a teen is easy as long as you are handing them money or feeding them! Making the tie. My first job was to print out the pattern and then trace it onto cardboard. I clicked on the pattern and saw those dreaded words “enlarge 200%” ugh! Why oh why couldn’t those wonderful folks on Martha’s staff figure out how to make a full size pattern? Now I have to use my brain and try to remember which buttons on my printer enlarge!! I ended up printing the pattern at 100% then cutting the pieces apart then copying them at 200% on my printer and then taping them back together. Sounds easy but it took me a few times to get it right! I had my pattern enlarged and then I realized it was too big for the cardboard that I had so I had to hunt down a cardboard box and cut it apart for my pattern. Once I finally had the pattern ready I noticed that it was for a 16 inch neck – last time I checked my son had a 14 1/2 inch neck so then I had to go back and forth trying to decide if I should shorten the pattern or if it would be fine once it was tied – I decided to shorten it. Now I was ready to actually make the tie! Before I could get going on the tie my son suddenly remembered that he had forgotten to order a corsage for his date – which I’m sure was my fault because I only reminded him 100 times. Martha would probably have simply run out to her greenhouse and without breaking a sweat whipped together a gorgeous corsage. I placed a quick call to the florist 10 minutes before closing time the day before prom and ordered a corsage of whatever flowers they could pull together. Back to the tie: I followed the directions and watched the video but the first seam had me confused. 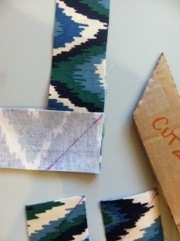 A bias seam: “lay pieces with angled ends placed together, right sides facing, at a 90-degree angle.” Following these instructions resulted in a zig zag. I played with it a little and realized the directions were wrong – how could Martha allow this to happen? I had to offset the seams to get it to work. On the second tie I changed the pattern slightly by cutting the top square and using the original diagonal edge as my stitching line and then trimming the extra fabric off. From that point on the directions were good and easy to follow. 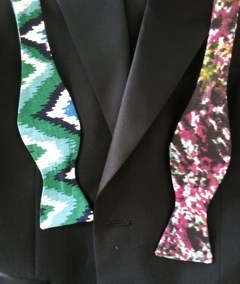 Both ties turned out great! He just needed to decide which one to wear. Once I had the ties finished I suggested that my darling boy try them with the shirt he was planning to wear so we could be sure everything looked good. He agreed and then ran out to his car and brought in his crumpled, dirty shirt. Ummm, honey? Were you planning to wash and iron this? Oh yeah Mom could you do it for me? Yeah, sure, you get a load of clothes sorted and I’ll throw it in. Uh Mom, I don’t know how to get a load of clothes sorted. Sweetheart, remember the dark clothes go together and the light clothes go together and the white clothes go together. Oh yeah I just don’t know if this is light or dark. We both survived getting ready for the prom and in the end I think that Martha would be proud. Here he is ready for the evening. Hope he had a great time—he looks fantastic and the bow tie is great . « Succulents and Terrariums and DIY oh my!